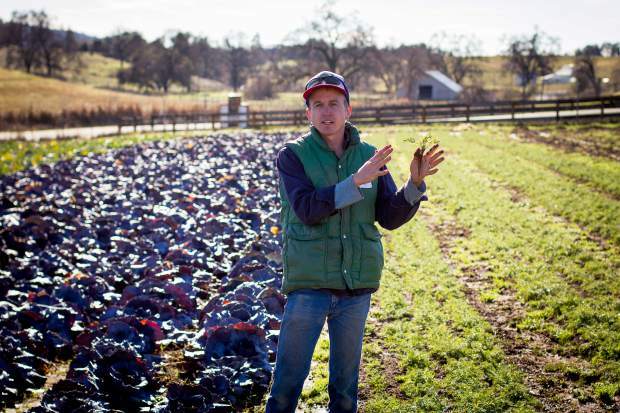 Jeremy Mineau of Super Tuber farm explains how he overwinters carrots during a farm tour as part of the 2015 Sustainable Food and Farm Conference. If you care about what you put in your body, you know that a locavore diet — eating locally grown or produced food — is something to strive for. But translating the concept into reality can be daunting. After all, not everyone can take the time to source the freshest organic produce and humanely raised chickens or — an even more committed level — grow their own food. And it can be financially difficult as well. When it’s cheaper to eat at McDonald’s, how do you get “regular” folks to the farmers market? “This is a huge problem that we all need to solve,” acknowledged family physician Daphne Miller, one of the keynote speakers at this year’s Sustainable Food and Farm Conference, which kicks off Thursday. On Saturday, Miller will be sharing stories from her medical practice to illustrate why local, organic farm produce is healthier, and why spending time in organic gardens and farms can promote health in a number of different of ways. The food and farm conference, organized by Sierra Harvest, offers up four days of workshops, farm tours and internationally-known speakers including Miller, farming celebrity Joel Salatin of Polyface Farms and Elizabeth and Paul Kaiser from Singing Frogs Farm. The event kicks off today with a full-day workshop for farmers on “Post-Harvest Handling and Food Safety.” Friday features a farm tour to Mountain Bounty Farm, Browning’s Timber and Fowler Family Farm. The same day, Tumbling Creek Farm will lead a workshop on growing mushrooms that is already sold out. There will be a free networking event hosted by Nevada County Tech Connection, the Ag Tech Micro Conference, on Friday afternoon. The micro-conference will bring together farmers, software developers, funders and other people who are interested in talking and learning about how technology can support local food production. Saturday is a full day with the keynote speakers, a farm expo and in-depth break-out sessions, followed by another full day of 20 workshops on Sunday on topics as varied as fermentation, permaculture, medicinal plants, grazing and tractor care. After spending time on family farms, Miller came to believe that it’s the farm where that food is grown that offers us the real medicine. All the aspects of farming — from seed choice to soil management — have a direct and powerful impact on our health, she argues. The best way for the average consumer to be as healthy as they can in their food consumption, Miller said, is to support healthy farms and healthy food. According to Miller, best practices for healthy farms include not tilling the soil, using a diversity of seeds and plants, conserving resources such as water, recycling compost and nutrients back into the soil, and minimizing or avoiding the use of chemicals. Consumers can take small steps to improve their food supply, Miller said.